On 27 October 2018, Robert Bowers killed 11 people in a Synagogue in Pittsburgh, Pennsylvania. In January 2017, an armed assault against a mosque in Quebec City left six dead. In 2011, Anders Behring Breivik carried out a car bombing and armed assault in Utoya Island in Norway, killing 77 people, many of them minors. The three attacks mentioned above have something in common: they weren’t either planned or perpetrated by jihadists. 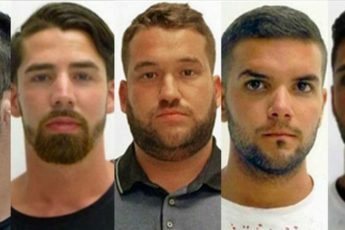 They are examples of far-right attacks. 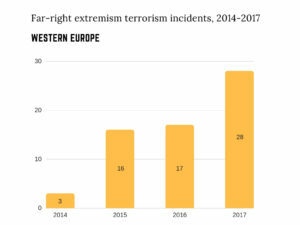 According to the Global Terrorism Index, although the number of deaths from terrorism has decreased for the third consecutively year, far-right attacks have been on the rise in Europe and America. 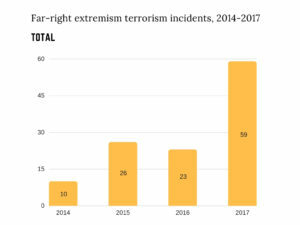 The number of incidents peaked and the number of deaths from terrorism associated with far-right groups jumped from 11, in 2016, to 17 in 2017. Once more digital media has played a role in the spread of radical propaganda. The report highlights the existence of at least 50 different far-right organisations that used the internet to amplify their messages of hate towards Muslims, immigrants and Jews. When it comes to jihadism, despite its lost of territory, ISIL remained the deadliest terrorist group with 4,350 deaths registered in 2017. 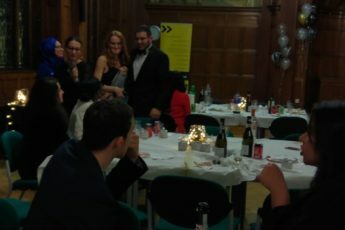 The number proves the group hasn’t been defeated. Although it only controls a mere 1% of the territory it once managed to establish a system of governance in 2014-2015, ISIL remains alive on the internet. Terrorist groups have always been quick to follow technological advances and the report predicts a growing threat regarding cybersecurity. If globalisation is accelerating and people tend to be even more connected in the future, good practices in radicalisation prevention must be widely shared as well. 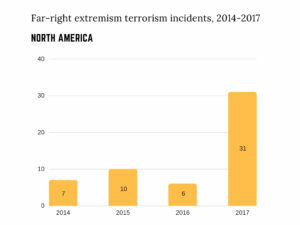 Growing efforts to challenge hate must not be retained to countries that are mostly affected now by either far-right or jihadist groups. In a globalised world, no one is exempt from receiving messages inciting hate. 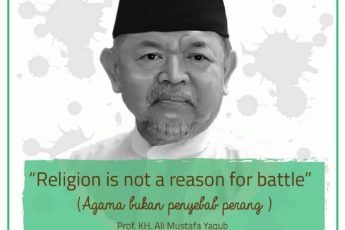 People should also be not exempt from receiving messages promoting peace.